Way back in 1906, a couple of bicycle mechanics from Dayton, Ohio obtained United States Patent #821,393 for some sort of wild, out there invention called a Flying Machine. It was actually their 1903 Wright Flyer design, but the patent office took three years to finally issue one of this country's most important patents ever. But on March 27, 2007, United States Patent #7,195,207 was issued to some guy out in Mojave who wants to fly people into space on commercial ships starting possibly as early as 2009. 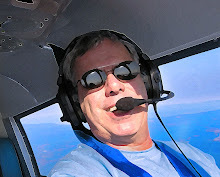 He's been around aviation a while, building some pretty “out there” flying machines that seem to go farther, fly higher and do more extraordinary things then anyone else's designs. That guy is Burt Rutan. 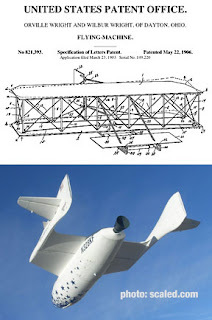 According to the US Patent Office, Rutan now has the rights to a spacecraft design including "...a fuselage, right and left wings extending from the fuselage, the wings having hinged aft sections with outer ends supporting rearwardly extending tail booms with vertical and horizontal tails with rudders and elevons, and an elevating system coupled between the fuselage and the aft wing sections for moving the sections from a normal airfoil shape to an elevated position producing high drag for slowing the spacecraft during atmospheric reentry after space flight, the elevating system thereafter retracting the aft wing sections to the normal airfoil shape for a controlled generally horizontal runway landing." Atmospheric reentry of a returning spacecraft is a critical flight phase due to high structural and thermal-heating loads. Horizontal-landing modern spacecraft intended for runway landing require three-axis control and more lift as compared to early blunt-body spacecraft (Mercury, Gemini, etc. ), which were lowered by parachute during landing. Rutan's "shuttlecock," or "feathering" wing system rotates its empennage to orient the spacecraft in an optimal attitude for atmospheric reentry. This invention relates to a winged spacecraft which is reconfigurable during reentry to a stable high-drag mode, and then returned to a regular flight condition for runway landing. I remember a lecture Rutan gave at the University of Oregon in Eugene right after winning the X-Prize with SpaceShipOne. 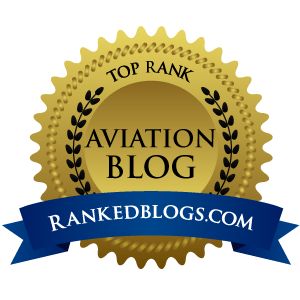 Long story short, he described how there have been only a few “breakthrough” times in commercial aviation. The first was the DC-3, which brought airline travel to the masses, followed by the dawn of the jet airliner age, which bumped up cruise speeds and allowed much longer domestic routes. The Boeing 747 again kicked commercial aviation up to a new height, but since then, Rutan says, there hasn't been anything that could be called a 'breakthrough'. So he is doing something about that. Rutan spoke of a day not too far off in our future when a craft could blast off and reach orbital altitudes, shut off the engines and basically coast around the globe, and then drop back into the atmosphere on the other side of the globe to perform a normal runway landing. A sample trip say from London/Heathrow to Tokyo would be far faster and more efficient because while the ship is gliding along in orbit through space at warp speeds, no engines are running. This was presented only as theory...or was it? Maybe Ol' Burt knows something about commercial space flight that we mere mortals aren't even able to grasp yet. I will go on record as saying this: There have been only a handful of really important aviation design pioneers, and Burt Rutan deserves to be on that very short list. When my grandkids are old enough to have kids, I predict that going off into space will be run of the mill, just strap in, place your tray table in its upright and locked position, and fling thyself into orbit, no biggie. When that happens, people can look back to 03.27.07 and Rutan's receipt of Patent #7,195,207 as the one that started it all. I feel lucky to have met this man a time or two, and to have lived in his era. Maybe the next Burt Rutan is some eight-year-old math whiz living in Wichita that likes airplanes...but for now, Rutan has no equal.